Pressure Transmitter meets 3A sanitary standard 37-01. AshcroftÂ® KS sanitary pressure transmitter features polysilicon thin film sensor technology. Transmitter portion of instrument is welded to Tri-ClampÂ® compatible seal of electropolished 316 SS. 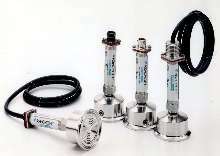 Process connections, available in 1.5 and 2 in., utilize 316L SS sensitive diaphragm and allow user to quickly remove or install transmitter. Pressure ranges are 0-30 psi through 0-1000 psi. Output signals can be specified in 4-20 mA, 1-5 Vdc, or 1-6 Vdc. Combining proven polysilicon thin film sensor transmitter technology with decades of diaphragm seal experience, Dresser Instruments has created the Ashcroft® KS sanitary pressure transmitter. The all-welded stainless steel construction of the KS pressure transmitter meets the 3A Sanitary Standard, 37-01. The KS sanitary pressure transmitter provides superior long-term stability and repeatability, performance attributes long associated with polysilicon thin film sensors. The transmitter portion of the instrument is welded to a Tri-Clamp® compatable seal of electropolished 316 SS. Process connections, available in 1.5 and 2 inch sizes, utilize a sensitive diaphragm of 316L SS material and allow the user to quickly remove or install the KS pressure transmitter. Pressure ranges are available from 0-30 psi through 0-1000 psi. Output signals can be specified in 4-20mA, 1-5Vdc or 1-6Vdc. The Ashcroft® KS pressure transmitter serves pharmaceutical, dairy, food processing, biotech and filtration markets where clean surfaces and easily removable transmitters are prime concerns. These instruments are also very suitable for quick-connect clamping in breweries, distilleries, wineries and citrus juice production plants. For information, customers may call the Ashcroft ActionLinesm, 1-800-328-8258. Pressure Transmitter meets safety certification of IEC 61508. Pressure Transmitter carries non-incendive Division 2 approval. Pressure Transmitter features compact design.